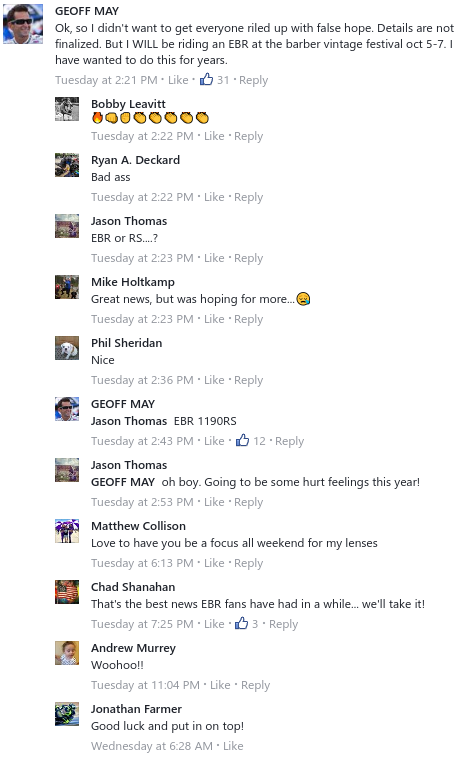 Former EBR racer Geoff May made this intriguing post to Facebook today. This may be more appropriate for one of the racing sub-forums, but it's definitely EBR news. He is going to jump the Grand Canyon? He picked up a fleet of them at the firesale and is starting a racing school? Where's your creativity ? . . . . .
Privateer racer with engineering backing/technological assistance from a certain Mr. Buell? Geoff . . . riding a bike that didn't commercially exist . . . has the talent, capacity and ability to embarrass some well funded factory folks. What a fitting "in your face" if Geoff and Erik would show up . . . absent the crap that accompanied HD and HERO . . kick a few asses and saunter into the sunset. Hahahahahaha . . . . Erik has the fight . . . Geoff has the right stuff. Does he currently have a ride? Doing a special, one-off race on an EBR for one last hurrah before its all over? >>>>EBR for one last hurrah before its all over? Hahahahaha . . .I see you are new to the world of Buell. That's what the banker said, in 1987, when he laughed us out of the bank trying to borrow $5,000. You may not be familiar with where the term "Elves" came from . . . I assure you that you will LOVE the story. Folks like Dano Lang, Tommy Anglim, Dave(s) Gess & Ulicki and a host of others have done some things that will live as motorcycle legends for years . . . . I think you could add Geoff (and probably Jodi) May to that list. He's racing the Barber vintage festival in October. Sounds like a good time. Hope he does well. "Dead! Court's right. Psychotic, but absolutely right. We gotta take these bastards. Now, we could fight 'em with conventional weapons. That could take years and cost millions of lives. No, in this case, I think we have to go all out. I think this situation absolutely requires a really futile and stupid gesture be done on somebody's part." No, it wasn't over, it never happened! Ughhh ... watch Animal House. A great piece of American cinematography. Hahahahaha . . . an American Classic . . . .should be required in business school. Maybe Geoff and Erik are going to take a harley dresser and turn it into a Death Cycle? Turn the Barber Vintage races into an expensive demolition derby? Ooo, or the RW750 at Barber! "Animal House" was nothing short of cinematic gold. Right behind it was "The Blues Brothers"
"We on a mission from Gawd!" Paint up another bike in prison stripes and get that Oklahoma hooligan on board too. If you go Blues Brothers put May in a dark suit and glasses riding a XB12XP. It's got a cop motor, a twelve hundred cubic centimeter plant. It's got cop tires, cop suspensions, cop shocks. It's a model made before the Wandell cataclysm, so it'll run good on regular gas. What do you say? Is it the new Buellsmobile or what? It's a hundred and six miles to East Troy, we've got a full tank of gas, half a pack of cigarettes, it's dark, and we're wearing sunglasses. "We're on a mission from Gad." Getting back to the original subject: Any idea what Geoff was alluding to? Anyone whose truly interested, and has Facebook access, can find the answer of Geoff's Facebook page. Wouldn't want to make 'non-public' information public again, now would I? I don't have Farcebook access, but I am curious. I would think that if Geoff put it up on Farcebook, it's now "Public" information and you or someone else could share it with us. Ok, so a one-off race, last hurrah. Best of luck to him! Its only about 8 hours away, tempting!